The Armenian Genocide Monument, “Tsitsernakaberd,” which translates to “Swallow’s Fortress,” was constructed in 1965 to commemorate the 50th anniversary of the Armenian Genocide. 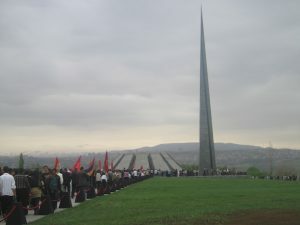 Twelve imposing pylons, representing the twelve provinces where Armenians were massacred, surround the eternal memorial flame inside the monument. The flame burns continuously to represent the un-extinguishable Armenian spirit. “Swallow’s Fortress,” is named for a bird that always returns to its nest, even if its home has been destroyed. 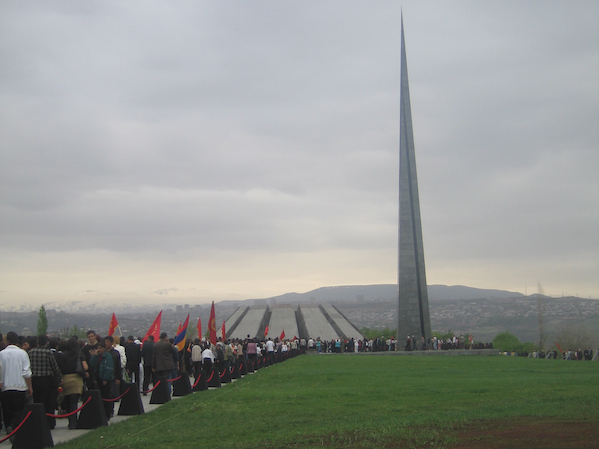 A unique portion of the monument is the tall, needle-shaped shaft beside it, which represents the rebirth of the Armenian people. During the 50th anniversary of the Armenian Genocide in 1965, a massive outburst of demonstrations throughout the Soviet Republic of Armenia, demanding a commemorative monument, led to the government’s decision to build Tsitsernakaberd. 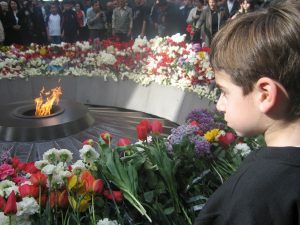 Since that time, every year on April 24th, thousands of people commemorate the Armenian Genocide with a visit to the monument, and throughout the year, more visit Tsitsernakaberd Memorial Complex, which includes a genocide museum and research institute.